In a Nutshell: For more than 100 years, Trustco Bank has provided a personalized touch to its customers. The institution’s home equity loan and line of credit are our 2019 Editor’s Choice™ for their low rates and flexible terms. Both products lend up to $300,000 and eschew the appraisal, origination, and closing fees that other lenders often charge. Loans typically close within 30 days. Unexpected expenses arise and finding the money to pay for life’s surprises can end up costing more than you anticipated, thanks to finance charges and hidden fees imposed by lenders looking to benefit from your financial hardship. And, as many credit card issuers continue to raise their interest rates, you may find yourself stuck in the vicious cycle of making minimum payments, which only exacerbates the problem. But not every financial institution tries to gouge its customers with rate hikes and hidden fees. 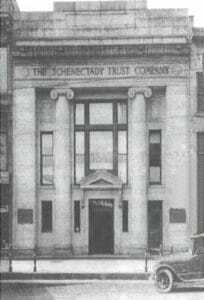 Since 1902, Trustco Bank has prided itself on being a neighborhood bank — even as that neighborhood has expanded past its Schenectady, New York, roots and into five states. Today, Trustco continues its long-standing practice of looking after its customers by offering a line of home equity products that do away with common fees and offers low rates to help consumers pay down high-interest debt or cover a big purchase. In April 2018, S&P Global Intelligence rated Trustco Bank the 15th best-performing savings bank in the country. Breen noted that Trustco doesn’t automate any of its departments, meaning that, when you call the bank with a question or concern, you’ll talk to an actual person whose top priority is meeting your needs. And that can be especially handy if you’re deciding between Trustco’s two main home equity products. The home equity loan and home equity credit line both offer benefits to consumers who’ve accumulated equity in their home and want to use it to create some financial breathing room. Consumers who have flexible spending needs may find Trustco’s home equity credit line to be just what they need. The line of credit works for first or second mortgages and offers credit limits between $7,500 and $300,000 with a fixed 12-month introductory interest period. After the intro period, the interest rate increases to the Wall Street Journal prime rate. “The home equity credit line product is something that we try to offer to customers who are looking to consolidate things like high-interest credit card debt or pay for small home improvements,” Breen said. Breen added that some customers take out the home equity line of credit as an emergency fund and don’t withdraw from the loan unless they need to. This is especially useful since customers only pay interest on whatever funds they’ve withdrawn from the loan. Trustco Bank can be found in New York, New Jersey, Vermont, Massachusetts, and Florida. Home equity credit lines allow a draw period of up to 10 years, followed by a 20-year repayment period. Once a payment is made on the account, the available balance increases. That affordability is a key factor that separates Trustco’s home equity products from credit cards or traditional loans when customers want to consolidate high-interest debt or make a sizeable purchase. Home equity loans are typically better suited for borrowers who know exactly what they’re going to use the money for, as the loan proceeds are paid out in one lump sum, with interest charged to the entire loan amount. That’s different from the home equity credit line, which allows borrowers to withdraw the approved loan amount in smaller increments over the 10-year draw period and only pay interest charges on withdrawn funds. That’s why you’ll often find consumers needing to make larger purchases opting for loans instead of credit lines. Trustco understands the differing needs of these two types of customers and has designed both products to work for their intended borrower. Trustco’s home equity loans have fixed interest rates for both first and second mortgages and lend between $5,000 and $300,000. As with the home equity credit line, Trustco doesn’t charge most of the fees that other institutions tack on — including appraisal and origination fees and closing costs. This helps to keep your overall loan balance down and your payments more affordable. So often in today’s tech-driven society, financial institutions opt to trade personal contact for quick service. We’ve become conditioned as consumers to sit through multiple automated prompts when calling banks, credit card issuers, or other service providers in search of a quick answer. Trustco Bank has been servicing clients since 1902. Trustco Bank doesn’t believe in robot assistants who never seem to properly respond to your question. For more than 100 years, the institution has put the communities it serves first by providing a dedicated staff that works to meet every customer’s needs. That attention to detail has helped grow the institution from a small town in New York to more than 140 branches in five states with over $4.9 billion in total assets as of December 2017. It’s also nice when you aren’t surprised by hidden fees and charges. Trustco’s transparent pricing lets customers know right away what they’ll be paying for their loan. While that may seem like a no-brainer, it’s not as common as it should be in today’s banking world. If you have existing high-interest debt that needs consolidating or a large purchase looming in your future, Trustco Bank may be your best choice, and that’s why it’s our 2019 Editor’s Choice.